The Boundary Waters Canoe Area Wilderness in Minnesota is one of the most iconic quiet-water paddling destinations in the U.S. and one of the most visited Wilderness areas in the country. For years, advocates for the Boundary Waters have been working to protect it from the threat of mining in the surrounding Superior National Forest. 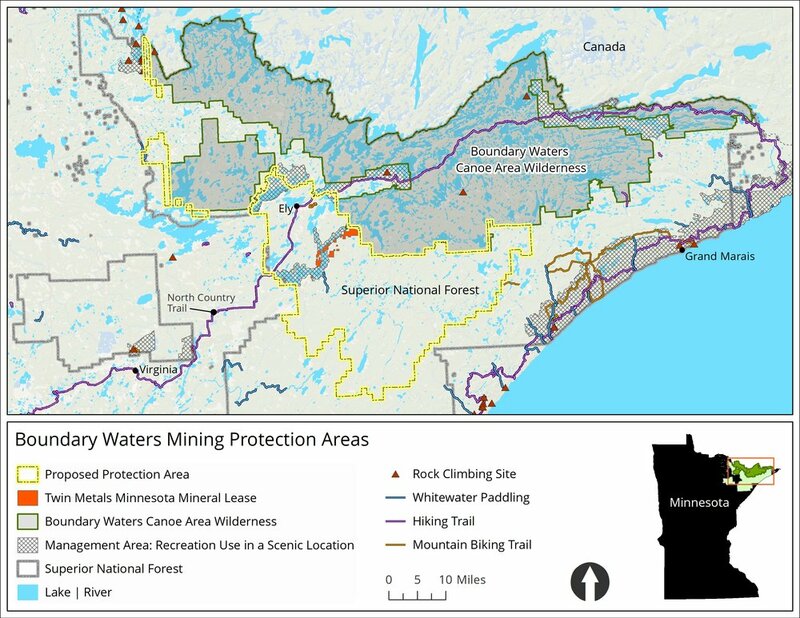 Some of these potential mines have a high risk of contaminating water, which makes them a significant threat to the interconnected system of lakes, rivers, and streams in the Boundary Waters. Over the last few years, officials considered a 20-year mining ban to help protect that region and were nearly finished with an environmental review of a potential mining ban. As we wrote earlier, the administration abruptly canceled this review. Click on the map to enlarge. Source: Outdoor Alliance GIS. In a new development, just before Christmas, Interior announced its intent to renew two expired mining leases near the Boundary Waters, with a 30-day review period that ends January 30 (extended from the original deadline of January 22). You can comment here. While Americans rely on mining to produce needed goods, there are significant environmental risks to mining. Some of these mines are especially likely to contaminate nearby water sources, making places like the Boundary Waters is especially vulnerable to irresponsible mining. In the map at right, you can view the proposed areas for the mine, which are adjacent to the Wilderness area. In addition, we’re concerned about the pace of Interior’s attempts to renew these leases. Announcing a comment period that only lasts 30 days and begins at Christmas does not leave the American people with enough time to speak up. The Boundary Waters has for generations provided some of the most exceptional paddling in the country, and we believe the outdoor community is committed to protecting and sustaining these traditions.